We are delighted to announce the 2016 Docklands Arts Fund Print Commission made possible by the support of TIO, the South Docks Fund and Savills Ireland. 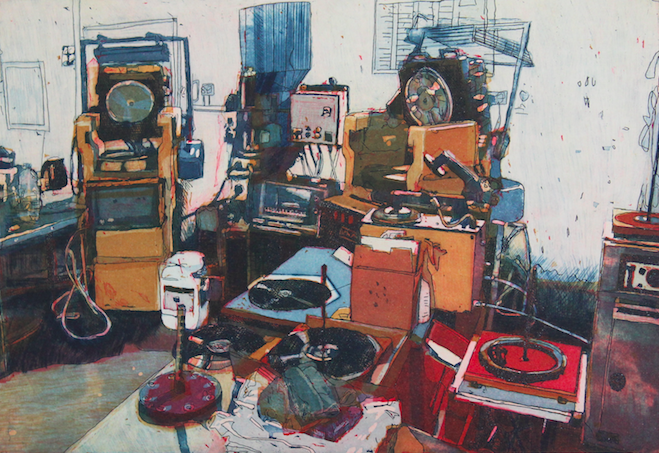 Artist Colin Martin is currently making a multi-plate etching in Graphic Studio Dublin – from his series of images of Masterlabs, a recording studio in Dublin’s North Docklands. This etching is a terrific way to celebrate Dublin Dockland’s music, industry and art traditions. All the proceeds of sales support the Docklands Arts Fund Small Grants Open Call for 2017. Last year’s Chris Judge Screenprint ‘A Shower of Dubs’ raised €21,000 towards three great art projects currently taking place in Dublin’s Docklands. Selected projects are listed here. This unique piece of Dublin Docklands Art will be made in a limited edition hand-made etching, and sold to collectors for a very special price of €100 unframed, or €250 framed, and will be available in November. If you are a business, organisation or individual based in Dublin’s Docklands and would like to support the Docklands Arts Fund, please get in touch. From Left to right, Andrew Hetherington. CEO, Business to Arts, Dee Forbes, Director General of RTE, Lorelei Harris, Head of Cultural Strategy, RTE & Sean McGrath, CEO of Allianz Ireland pose for the 2016 Allianz Business to Arts Awards. Picture Conor McCabe Photography. 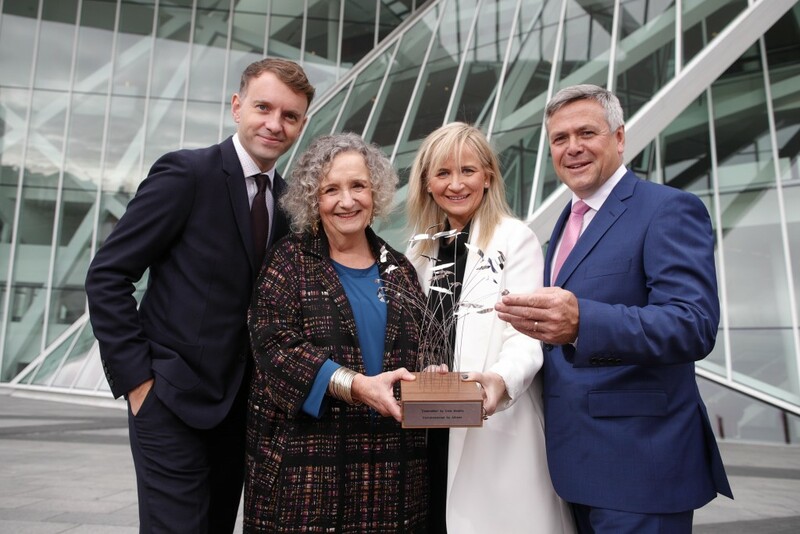 Sky Arts/Sky Ireland, Cartoon Saloon, Bank of Ireland, An Post and ESB were among the winners in 12 categories at the 25th annual Allianz Business to Arts Awards ceremony at the Bord Gáis Energy Theatre on Monday, September 19th. This year’s Allianz Business to Arts Awards, attracted a record number of nominations with over 15% related to the 1916 commemorations. The Awards recognise businesses, artists and arts organisations that develop creative partnerships to bring businesses and the arts into mutually beneficial relationships across society. The evening was a celebration of the most innovative and creative partnerships in Ireland which use the arts to enhance communities and working environments. In addition to the award winners, RTÉ received the 25th Anniversary Special Award from Allianz and Business to Arts in recognition of its long-term contribution to the development, support and promotion of the arts during the 25-year history of the awards. Leading the congratulations among over 500 business and arts leaders at the theatre was Minister for Arts, Heritage, Regional, Rural and Gaeltacht Affairs, Heather Humphreys TD. 2016 marks the 25th anniversary of the Allianz Business to Arts Awards, which recognise businesses, artists and arts organisations that develop and sustain creative partnerships. The awards recognise large, mid-sized, small and long-term sponsorships, staff engagement activities, commissioning, corporate social responsibility programme, community engagement and portfolio-based partnerships. Many of the short-listed collaborations are the result of long-term relationships. 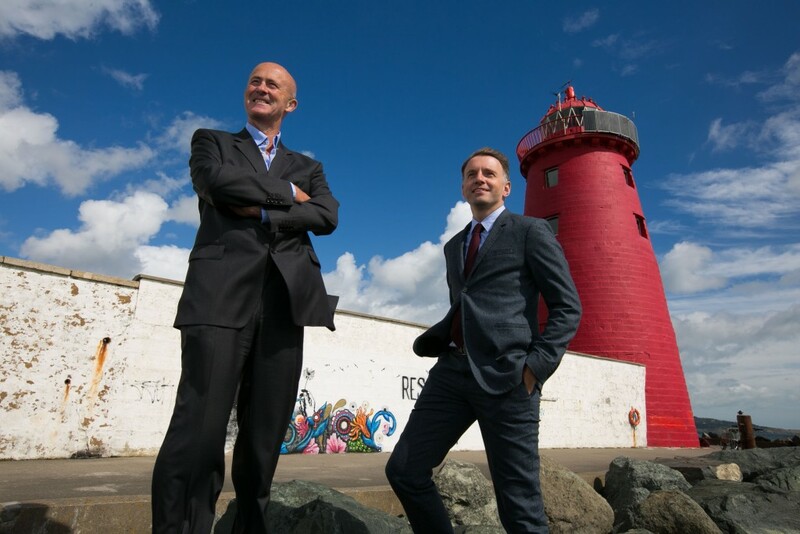 Eamonn O Reilly, CEO, Dublin Port Company & Andrew Hetherington at Poolbeg Lighthouse announcing the launch of Port Perspectives. Picture by Shane O’Neill Photography. We are delighted to announce the launch of ‘Port Perspectives’, a Dublin Port Company commission that will create a series of original and innovative public artworks/installations. These commissions will be realised throughout 2017 and respond specifically to the built environment, local areas, history and context of Dublin Port. The commissioned artworks will be part of a year-long programme of activity in 2017, which include an exhibition of works by the Belgian artist Eugeen Van Mieghem at Dublin City Gallery the Hugh Lane and a range of related arts education and engagement activities. The commission is open to arts practitioners in the areas of visual arts and film. There is an open category for artists and arts projects using other media that are keen to respond to Dublin Port Company’s commissioning brief. Proposals may be made for temporary and permanent artworks and a number of locations within Dublin Port have been selected as potential locations for commissioned work. These include Poolbeg Lighthouse, the Half Moon Battery, Dublin Port Company’s Headquarters and the North Quay Extension close to the East Link Bridge. Details of all Dublin Port locations are included in the open call documentation. Business to Arts will project manage the open call with an advisory curatorial panel. The deadline for applications is Monday 10 October, 5 pm. The shortlisted artists will be notified in November 2016 and the commissioned artists will be announced in early 2017. For more information, please download the Open Call document and click here to complete your online application. Note to Dublin Docklands-based businesses: Business to Arts are currently developing a range of opportunities for businesses (of all sizes) to get involved with creating opportunities for artists, audiences and enriching the Dublin Docklands. For more information on the Docklands Arts Fund select here.